Successfully Added Sunroad FR821A Sports Watch - Altimeter, Barometer, Compass, World Time, Pedometer, Calorie Counter, 3ATM, Backlight to your Shopping Cart. 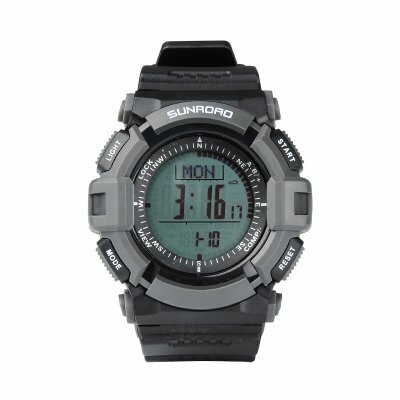 With the Sunroad FR821A Sports watch, no adventure will be too tough for you. The smart watch brings a multitude of useful functions right to your wrist. So, whether you want to climb a mountain, go on a lengthy hike or take a trip down a wild river, the Sunroad FR821A will be right there by your side with lots of help on offer. The FR821A smart watch is made with the adventurers in mind. Designed specifically for mountaineers, travelers and extreme sports lovers, the sports watch is a great companion for all those looking for a bit more adrenaline. You will find that the FR821A watch comes with some standard features, including a Pedometer (for keeping track of your fitness progress), Calorie Counter (to see how much you are burning off) and Distance Recorder (so that you can see how far you’ve come). However, there’s much more to the sturdy device than that. With the FR821A smart watch, you will also get Barometer (for tracking weather changes and making sure you are well-prepared), Altimeter (a useful feature for the fans of mountaineering) and Compass function (so that you are never lost in new terrain). The Sunroad FR821A smart watch comes with a sturdy built, perfect for the outdoors. What’s more, the watch features waterproof protection and has a 3ATM water resistance rating. This watch will send you timely reminders regarding battery life and comes with a display backlight, letting you have a perfect view of the screen even after dark. So, let’s sum things up. With the FR821A smart watch, you have a wearable that is practical, sturdy and meant for the outdoors. It’s simple and compact, customizable, comes with lots of useful features and a price tag much lighter than that of the competitors. The Sunroad FR821A Smart watch comes with 12 months warranty. Brought to you by the leader in electronic devices as well as wholesale smart watches..